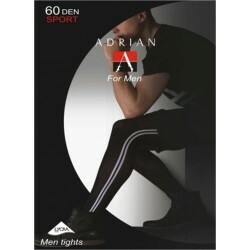 Semi-opaque microfiber tights for men that, according to our customer's feedback, may look more sheer than one would expect for 60 Deniers. The brief portion has a different fabric, although not very noticeable. These tights have a male flont panel (no fly opening), flat seams, and invisibly reinforced toes. Semi-opaque microfiber tights that, according to our customer's feedback, may look more sheer than one would expect for 60 Deniers. The brief portion has a different fabric, although not very noticeable. These tights have a male flont panel (no fly opening), flat seams, and invisibly reinforced toes. NOTE: Marine color has been discontinued. very soft tights and male panel look fine however , my one run off when i wore it second time at around male panel . I bought the marine colored tights. They are a dark navy blue and go great with jeans. These are great high quality tights with great support and a nice sized waisband. The Fumo/Gray is a little more sheer than I expected for 60 deniers, but still opaque. These tights are wonderful to wear. Wore these yesterday with shorts. Great fit, non binding waist band, opaque leg, great support and extra warmth. Also the male comfort panel is soooooo comfy. Great pair of tights, for us guys.